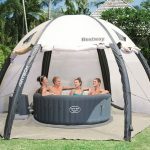 This year Lay-Z-Spa have released a new dome and igloo enclosure for their inflatable hot tubs improving on the older design they had before. The Lay-Z-Spa Hot Tub enclosure has a spacious design with the ability to open and close all the sides of it allowing maximum ventilation, privacy where needed or to protect against wind from one side. Closing all side when not in use also prevents cats from getting near your hot tub, protecting against debris from landing on it and also added protection from kids playing in the garden and helping to stop them getting close to it. The additional cover and protection will also help provide extra heat efficiency too. The dome and gazebo enclose is portable and easy to set up just like a tent. 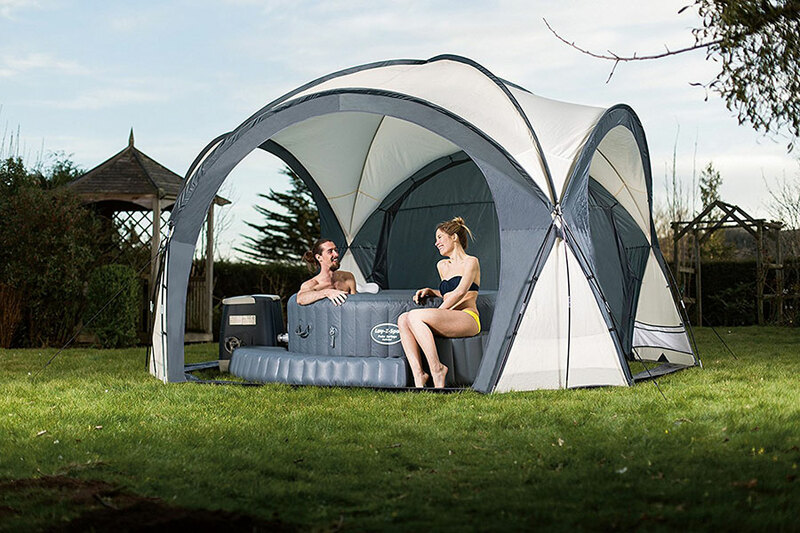 Unlike their hot tubs this dome is not inflatable and instead using rods just like a traditional tent with adjustable cords on each corner to be pegged into soft ground. This can be used on grass and if needed on a patio with it pegged into a nearby flower bed or using some sort of weight to hold it down, be it a brick or heavy box. 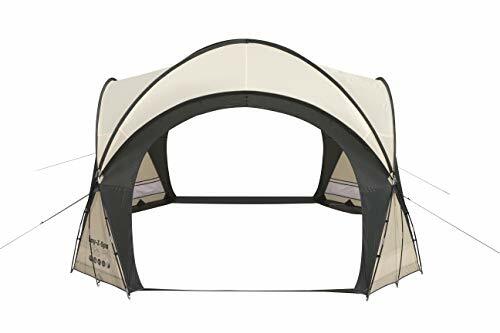 The rigid structure and poles of this make it better for more windy conditions then the older inflatable dome model, it is more like a tent and is designed well, the waterproof material also helps protect against the elements too. 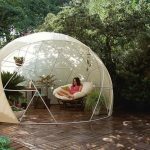 There is no base or floor to the dome so if can be easily installed and set up over your hot tub if it is already set up, just ensure there is enough room around the edge for the gazebo to sit around. Once erected the dome is 390cm wide and deep, with a height if 255cm. This is large enough to cover all Lay-Z-Spa hot tubs and still leave room around the edge ideal for the inflatable surrounds that can be bought too. This is designed for protection from the elements, however in strong winds it is advisable to either take the dome down, or at least open the fold down vents on the sides to allow the wind to flow through. There is no need to keep this up to protect the hot tub as this is designed to remain outdoors, the dome is only designed for protecting people using the spa. If you are looking for some privacy or some protection from the wind then the is ideal, the dome isn’t cheap however it fits perfectly over all Lay-z-Spa hot tubs and works well. It comes with all you need to set up right away on grass or soft ground, additional fixings may need to be bought for concrete or decking. Hi I am writing to complain about my lazy spa dome. I bought this to enjoy my time in the hot tub at night but I have had more trouble than a little. For one the littlest bit of wind and the whole thing goes all over the garden and has ripped grass up. We have put stone in the sides and tried everything but it is useless. We have tied it to posts and the string has just ripped off the dome. Where the black rods go threw the dome in the wind they have come apart and ripped the dome material. I am very upset with this as I payed almost 200 pounds and it has ruined my experience in the hot tub. To me it looks like it’s cheaply made and sold over priced. That is a rubbish review. We have had 80mph winds, just pulled one side up. Took 2 sides down halfway for wind to flow and was fine. Think you just want something to moan about. Maybe you dont know what your doing.